What Is Microsoft Paint 3D? Available in Windows 10 only, Paint 3D is a free program from Microsoft that includes both basic and advanced art tools. Not only can you use brushes, shapes, text, and effects to create unique 2D art but you can also build 3D objects and even remix models made by other Paint 3D users. The Paint 3D tools are easily accessible for users of any experience level (i.e., you don't need to be an expert in 3D design to know how to use Paint 3D). Plus, it's also perfectly functional as a 2D program and works much like the classic Paint program, only with more advanced features and an updated user interface. The Paint 3D application serves as a replacement for the older Paint program. More on that below. The Paint 3D application is only available on the Windows 10 operating system for PCs and the Surface Hub. See where you can download Windows 10 if you don't already have it. Visit the download link below and select Get to launch Microsoft Store, and then choose Get once more to download and install Paint 3D. You can open the program from the Start menu by searching for paint 3d. There are other free 3D software programs you can download if you don't have Windows 10 or even a Windows OS. Paint 3D adopts many features found in the original Paint app but also incorporates its own spin on the program, most notably the ability to make 3D objects. Lots of art tools: a marker, calligraphy pen, oil brush, watercolor brush, pencil, eraser, crayon, pixel pen, spray can, and fill tool. Any of them can be any color you wish, and each have their own options, like for choosing the line thickness and opacity. Basic models are included which you can import directly onto the canvas, like a man, woman, dog, cat, and fish. However, you can download more 3D models directly into your project from the Remix 3D community. Colors can be sampled from the Eyedropper tool for easy selection based on existing colors on the canvas, and you can also pick manually by entering the color's hex value. 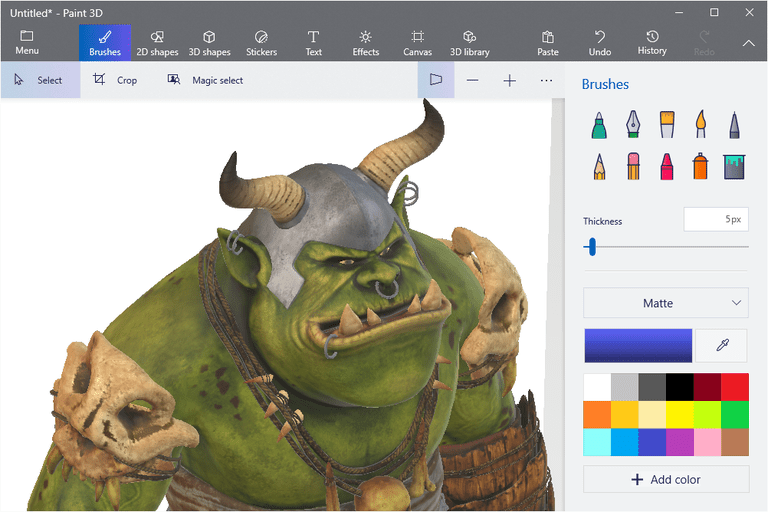 Paint 3D Includes a crop tool to trim down an image. The software lets you insert stickers, textures, and shapes that can be planted directly onto a 3D model. You can also make your own Paint 3D stickers from image files. 2D objects can be "converted" into 3D objects using only the built-in tools. In 3D mode, the lighting position is customizable through the easy-to-use Light wheel tool. Both 2D and 3D text can be used in Paint 3D. Several effects are supported to quickly change the whole canvas' scene, like a clay, aqua, stratus, and taffy effect. Paint 3D supports quickly flipping an image vertically or horizontally, as well as rotating it in place and moving it through 3D space. The whole canvas size can be resized by percentage for quick changes, or by pixel for specific changes. You can open regular image files in Paint 3D, like PNG and JPG, but also 3MF, FBX, STL, PLY, OBJ, and GLB files. An image can be saved to a 2D format, 3D format, and/or uploaded to Remix 3D. Once it's on Remix 3D, you can share your designs over Facebook and other social media sites. You're able to scroll back and forth through the history of the editing process to make changes, as well as export every recorded change to an MP4 video to show what was involved during the life of the project. Microsoft Paint is the non-3D graphics editor that has been included in Windows since Windows 1.0, released in 1985. This iconic program, based on a program by ZSoft called PC Paintbrush, supports basic image editing tools and drawing utensils. Microsoft Paint has not yet been removed from Windows 10 but did receive a "depreciated" status in mid-2017, meaning that it's no longer actively maintained by Microsoft and will likely be removed in a future update to Windows 10. You can open the classic Paint program in Windows 10 by searching for paint in the Start menu or by executing the mspaint command in the Run dialog box or Command Prompt.